For the agricultural term, see Lodging (agriculture). 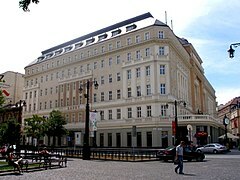 Hotel Carlton in Bratislava, Slovakia. Lodging refers to the renting of a short-term dwelling. People who travel and stay away from home for more than a day need lodging for sleep, rest, food, safety, shelter from cold temperatures or rain, storage of luggage and access to common household functions. Lodging is a form of the sharing economy. Lodging is done in a hotel, motel, hostel, inn or hostal, a private home (commercial, i.e. 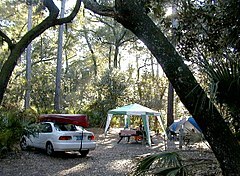 a bed and breakfast, a guest house, a vacation rental, or non-commercially, with members of hospitality services or in the home of friends), in a tent, caravan/campervan (often on a campsite). Lodgings may be self-catering, whereby no food is provided, but cooking facilities are available. Lodging is offered by an owner of real property or a leasehold estate, including the hotel industry, hospitality industry, real estate investment trusts, and owner-occupancy houses. Lodging can be facilitated by an intermediary such as a travel website. Airbnb is the largest facilitator of lodging. Commercial lodging is affected by regulations in many jurisdictions. Requirements can include acquiring business licenses, payment of transient occupancy tax and complying with building, city and zoning standards. The hotel industry has lobbied governments to increase regulations on commercial lodging in owner-occupancy houses. In New York, hosts cannot rent their property for less than 30 consecutive days unless they are currently living in the property. In Berlin, lawmakers have banned owners from short term real property rental without first requesting permission from authorities. Hosts can be required to pay a fine of up to €100,000 if they rent more than 50% of their property space. Landlords can still rent individual rooms with the condition that they live in most of the property. In 2018, to combat the local housing crisis, the government of Tasmania offered AU$10,000-13,000 to landlords to rent out their spaces for longer terms at lower costs instead of listing them as short term lodging. London passed an amendment to its housing legislation in March 2015 allowing short-term lodging rentals of up to three months a year. In May 2018, Madrid announced proposals to reduce the number of lodging rentals in owner-occupied houses to help tackle "over-tourism" in the city. The plan aims to preserve residential home rentals in the central areas of the city, preventing them from becoming accommodations exclusively for tourists. In July 2018, Palma de Mallorca, Spain banned home-sharing sites, such as Airbnb. Arizona prevents municipalities from interfering in private property rights, and therefore has minimal restrictions on lodging. Proposed 2017 legislation sought to ban municipalities from introducing zoning laws lacing restrictions on private property owners. In January 2017, West New York, New Jersey, a suburb of New York City, passed the same ban. Portland, Oregon created a new zoning code in 2016 to regulate short-term lodging rentals and it includes several limitations, such as capping the number of bedrooms in a single unit that may be listed. Additionally, Portland pledged in 2015 to dedicate a portion of collected occupancy taxes to affordable housing uses. In 2017, San Francisco passed a law requiring renters of lodging to register with the city before they can rent units. Units cannot be rented for more than 90 days a year. Santa Monica implemented regulations in 2016 that include prohibition of rent-controlled units from being listed as short-term rentals. In December 2017, the City of Toronto, under John Tory banned homeowners from leasing basement suites with separate entries and other unlicensed residential dwellings for short-term rentals, stating intention to protect the long-term rental market. Government-issued licensing and fees would also be required of hosts to continue with short-term rentals. The new restrictions were criticized by some owners who had relied on lodging rental as a source of income. Application of the new rules has been suspended following complaints by four renters to the Ontario Municipal Board. The complaints will be heard by the Local Planning Appeal Tribunal, which will hear the case on August 26, 2019. In November 2017, the Vancouver City Council adopted regulations and restrictions against owner-occupied rentals to protect the long-term rental market, which it stated was just above zero availability. The regulations allow owners to rent only their principal residence and require them to obtain a paid license, with acquisition and maintenance fees, with a number to be displayed when listing any space for rent. A voluntary transaction fee of 3% was also to be implemented per reservation. The opposing Non-Partisan Association criticized the new regulations, as did some owners, claiming they deprived them of personal property income. Councillor George Affleck argued that the city was creating more bureaucracy and taxation, and not solving the problem, arguing that it made Vancouver even more costly place to live, also giving the opinion that more long-term rental housing should be built. ^ Dobbins, James (July 7, 2017). "How to Host on Airbnb Legally". The New York Times. (Subscription required (help)). ^ Tun, Zaw Thiha (August 31, 2015). "Top Cities Where Airbnb Is Legal Or Illegal". Investopedia. ^ Oltermann, Philip (June 8, 2016). 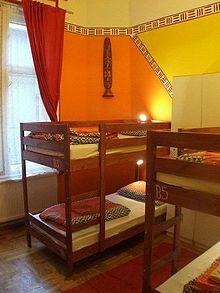 "Berlin ban on Airbnb short-term rentals upheld by city court". The Guardian. ^ "Get out of Airbnb: Tasmania offers landlords $13,000 for long-term rentals". 13 April 2018. ^ LaGrave, Katherine (June 2, 2017). "8 Cities Cracking Down on Airbnb". Condé Nast Traveler. ^ Street, Francesca (15 May 2018). "Madrid takes on Airbnb and overtourism". CNN. ^ Minder, Raphael (23 June 2018). "To Contain Tourism, One Spanish City Strikes a Ban, on Airbnb". The New York Times. ^ "Airbnb gets free rein in Arizona thanks to new law". Dara Kerr. Cnet. ^ Slodysko, Brian (March 19, 2017). "Indiana Considers Prohibiting Cities From Banning Airbnb". U.S. News & World Report. ^ Sikich, Chris (February 14, 2017). "Indiana House passes bill to protect Airbnb rentals". The Indianapolis Star. ^ Dia, Hannington (February 4, 2018). "Banning Airbnb in West New York: After complaints, town adopts ordinance banning short-term rentals". The Hudson Reporter. ^ "Accessory Short-Term Rental Permits". Portland. ^ "Portland Dedicates Short Term Rental Lodging Tax to Housing Investment Fund". housingtrustfundproject. ^ Somerville, Heather; Levine, Dan (May 1, 2017). "Airbnb, San Francisco settle lawsuit over short-term rental law". Reuters. ^ "Court denies companies' motion to enjoin the City's Home-Sharing Ordinance". Santa Monica. March 12, 2018. ^ Rider, David (8 December 2017). "Basement apartment owners unhappy with city ban on Airbnb-like rentals". Toronto Star. ^ Beattie, Samantha (September 5, 2018). "Appeal stalls Toronto's short-term rental rules for at least a year". The Toronto Star. ^ Pelley, Lauren (April 5, 2018). "Toronto's short-term rental bylaws could be delayed months over OMB appeals". CBC News. ^ Kane, Laura (14 November 2017). "Vancouver bans short-term Airbnb rentals in laneway homes, basement suites". ^ Austen, Ian (15 November 2017). "Vancouver Limits Airbnb, in an Effort to Combat Its Housing Crisis". The New York Times.